MS Allure of the Seas is the sister ship of passenger ship Oasis of the Seas. The $1.2bn vessel was constructed at STX Europe's Turku Shipyard. The 12,000t ship measures 1,181ft long with a height of 213ft above the waterline, with a maximum beam of 154ft. MS Allure of the Seas offers five types of accommodation and includes 37 categories of rooms and suites. MS Allure of the Seas first sailed in December 2010. Her maiden voyage took place in the east and west Caribbean. The vessel includes the fleet's 'neighbourhood' concept of seven themed areas. MS Allure of the Seas is the largest cruise ship in the world and is an Oasis Class cruise ship owned by Royal Caribbean International. Delivered in October 2010, the vessel is the sister ship of the passenger ship Oasis of the Seas. 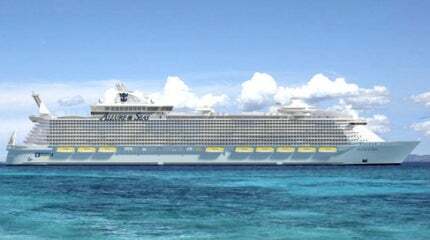 MS Allure of the Seas was constructed at STX Europe’s Turku Shipyard with an investment of $1.2bn. Her keel was laid at the shipyard in December 2008 and her maiden voyage took place in December 2010 in the east and west Caribbean. The ship was out of service in February 2014 as she underwent repairs at Grand Bahama Shipyard in Freeport, Bahamas, after experiencing bearing wear in one of the propulsion motors. Royal Caribbean International awarded a contract for the construction of the third Oasis class cruise ship (Harmony of the Seas) in December 2012. The construction of the $1.3bn vessel began in September 2013. The new ship was built by STX France at its St. Nazaire shipyard and delivered in May 2016. MS Allure of the Seas spans 16 decks and accommodates 5,400 passengers in 2,704 double occupancy staterooms and loft suites. It includes the fleet’s new ‘neighbourhood’ concept of seven themed areas. Decks six to 14 include staterooms and the top two decks house the loft suites. There are also five dining rooms and a concierge club, theatre, library and business centre. Each themed neighbourhood contains a variety of restaurants and bars. The 12,000t ship is 1,181ft-long and has a height of 213ft above the waterline, with a maximum beam of 154ft. It is propelled by three electric azimuth thrusters of 20MW each and Wärtsilä diesel engines. The ship can travel at a cruising speed of 22kt. The MS Allure of the Seas offers five types of accommodation and includes 37 categories of rooms and suites. New Royal Princess is a cruise liner being constructed by Fincantieri for the British-American cruise line Princess Cruises. Loft suites are spread across 2,000ft² and feature spacious living areas, double-height ceilings, balconies, and floor-to-ceiling windows offering sea views. The bathrooms are fitted with rain shower heads, natural stone and glass tile accents. There are three types of loft suite. Along with three types of loft suite, royal; presidential; owner; grand; and junior suites are also onboard, with each type offering different features, interior designs and views. The ship’s other accommodation includes balcony staterooms such as Central Park balcony, Boardwalk balcony and standard staterooms. The ship also offers staterooms with views of the Central Park, Boardwalk and Promenade neighbourhoods. MS Allure of the Seas has the same facilities as Oasis of the Seas. The ship has seven neighbourhoods along with an aquatheatre, spa and fitness facilities, a pool and sports zone, an entertainment area and a youth zone. The landscaped Central Park neighbourhood on deck eight features a themed garden with tropical foliage and on-site horticulturalist. It includes Giovanni’s Table restaurant, Vintages wine bar, Park Cafe gourmet market, Parkside Gallery boutique shopping area and a portrait studio. "MS Allure of the Seas spans 16 decks and accommodates 5,400 passengers." Deck four includes Royal Promenade’s mezzanine level and promenade bridge. Guests can visit jewellery shops and dine at restaurants and bars. The promenade features Rising Tide, a bar that moves slowly up and down between three decks. A pool and sports zone are located on deck 16. The deck includes four pools for all ages, four bars and a lounge with whirlpools and a restaurant. The zone also features a sports deck with basketball and volleyball courts, two Flow Rider surf simulators, a miniature golf course and a zip-line. Vitality at Sea Spa and Fitness Centre is located on decks five and six. The spa includes solo and couple massage suites, a thermal suite, a youth spa and a beauty salon. The fitness centre has a kinesis centre providing studio fitness and yoga classes. The centre has 158 cardio and resistance machines, as well as the largest jogging track at sea. Boardwalk on deck six features a carousel, two rock climbing walls and an aquatheatre, has along with six restaurants, Joney Rockets and Boardwalk bars, and a variety of shops. "The 12,000t ship is 1,181ft-long and has a height of 213ft above the waterline"
Deck two is home to Entertainment Place, which offers guests the chance to play at Casino Royale, watch shows at a 1,380-seat theatre and listen to live music in a jazz and blues lounge. There are also ice shows at Studio B, family shows and comedy acts at Comedy Live and dancing at Blaze nightclub. The ship’s Youth Zone is exclusively for kids and teens and offers Adventure Ocean youth programmes. The Youth Zone has a toddler nursery, an open gym area for activities and games, a science lab for interactive science activities and a dedicated workshop space for craft. It also has a teen disco and teen lounge, a youth spa and a fitness centre. Oasis of the Seas is the first of the Oasis Class luxury cruise ships in the Royal Caribbean International fleet. AIDAstella is a new cruise ship being built by AIDA Cruises of Germany.